Okay you come to Greece to star at the sea. There is no sea up in Kambos, the village closest to the Greek Hovel where I live. As you sit in Miranda's you stare up at the castle, you see cars, lorries or flocks of sheep wind their way along the road, and you see like in Kambos progress at its slow place. We sit outside on one of the four tables underneath a wooden shelter. On another table the father of Vangelis from the snake repellent shop was holding court. He was chatting for five other older men, I guess not that much older than I am, as they nibbled some cheese and tomatoes and drank merrily. In due course Vangelis wandered over. He can keep an eye on the store and have a beer at the same time. Im not sure what was being discussed but there was no rush to end the lunch, after all it was only four in the afternoon when we left. As ever, whatever the menu says about a wide selection there was just one selection - it was pork and peppers today. 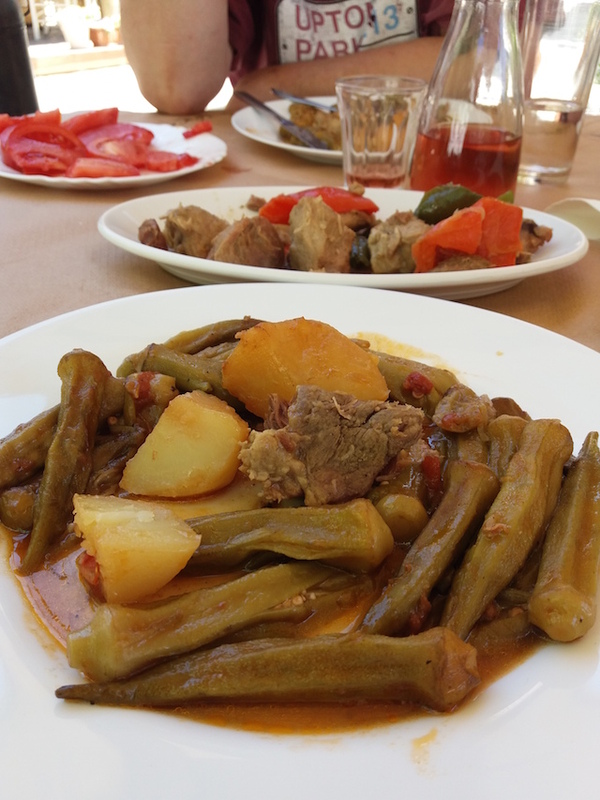 The choice was whether you wanted it with new boiled potatoes in a sauce or okra in sauce. We went for the latter and some tomatoes for Joshua. The total damage for two portions of pork & peppers and okra and the booze and Joshua's tomatoes was 14 Euro - call it £11. Not only is that much cheaper than by the sea, the food is fantastic and the pace just so slow. I have won her over, the Mrs is a member of the Miranda's fan club too. As for Miranda herself she picked up Joshua and took him round to introduce him to everyone. He did not quite know what was happening but enjoyed his celebrity status.